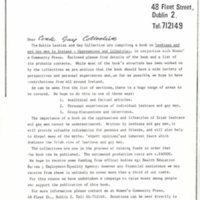 In 1986 Out For Ourselves: The Lives of Irish Lesbian and Gay Men was produced by the Dublin Lesbian and Gay Men's Collectives and Women's Community Press. 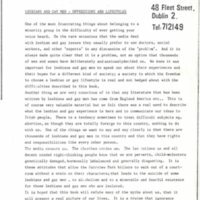 It was one of the first Irish produced and written publications detailing the lives and experiences of lesbian and gay men in Ireland. It contained a variety of contributions, including ones from LGBT people in Cork.